In a way, Roger Federer might get exactly what he wants during his return to the BNP Paribas Open in Indian Wells this week. Federer said he came to the ATP World Tour Masters 1000 tournament to face the best, and he should have that opportunity early and often at the Indian Wells Tennis Garden. The four-time champion has been drawn in the same quarter as five-time champion Novak Djokovic, three-time titlist Rafael Nadal, Argentine Juan Martin del Potro, Alexander Zverev and World No. 16 Nick Kyrgios, who's coming off his first win against Djokovic last week in Acapulco. It's the first time that Federer, Nadal and Djokovic have been drawn in the same quarter. They were drawn in the same half for the first time last year in Rome. The Swiss star isn't sure if he's faced a tougher draw during his 20-year career, but he's also not worried. “It doesn't matter. I've gone through so many draws. I came here to Indian Wells to play against those guys. 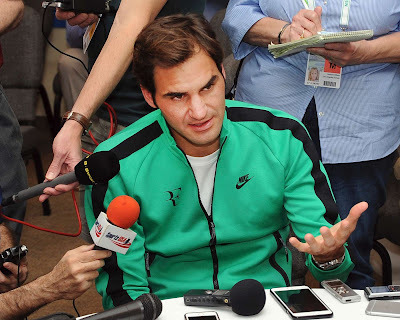 So it doesn't matter if it's a semi, a final or actually a fourth round,” Federer said during his pre-tournament press conference on Wednesday. The 35 year old can't meet Nadal until the fourth round, but even that isn't a sure bet for Federer, who's returning to Indian Wells for the first time since 2015. Knee surgery last year forced him to miss the tournament after 15 consecutive main draw appearances in the desert. In the third round, Federer could meet former Top 10 player Kevin Anderson or 24th seed and California native Steve Johnson. Next, Federer might face Nadal in the fourth round, which would be the earliest they've met at a tournament since their first meeting in 2004, when they played in the third round in Miami. Since Nadal took that debut contest, 13 years and 34 more ATP Head to Head meetings have passed. Nadal leads their ATP Head to Head rivalry 23-12, but Federer has won their past two contests, including the Australian Open final in January. If Federer advances past Nadal and the seeds play out on the bottom portion of the draw, Federer will face Djokovic, who's looking to extend his 17-match win streak in the desert and claim his fourth consecutive Indian Wells title. But del Potro, Zverev and Kyrgios also loom in the Serbian's section. Helping Federer stay relaxed is that winning feeling he's still carrying from Down Under. The 18-time Grand Slam champion said it feels like his five-set win against Nadal happened just yesterday. The right-hander has a 52-11 career record in Indian Wells, a run that includes four titles (2004-06, 2012) and two runner-up finishes (2014, 2015).